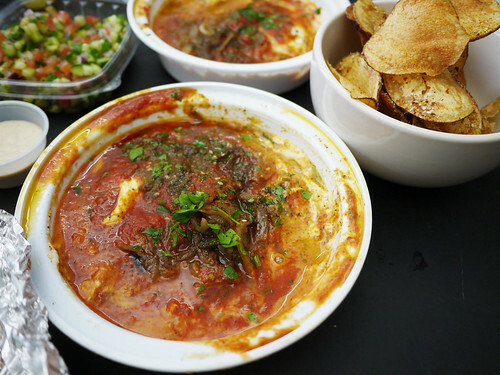 In brief: I'm amazed at The Shuka Truck, what an unusual idea to create a food truck around shakshouka, mostly because it's strange to imagine a dish that is normally served in cast iron pans coming to you in plastic takeout containers. Still the plastic container does little to diminish the great tasting eggs coming out of The Shuka Truck. We tried a salad and chips, both quite nice accompaniments to the shakshouka. Definitely looking forward to going back.